I was really excited to finally get started reading Roomies by Christina Lauren, as the story sounded really cute, it’s been way too long since I’ve read a book by these ladies. Their books are always fun to read, and Roomies was no exception! It was a quick, fun read that left me wanting more, and now I totally want to read more books like this as soon as I possibly can. Do you ever just want to read a book that’s super fluffy and a really quick read? That’s exactly what you get with Roomies. Seriously, this book was all kinds of adorable; a marriage of convenience, a hunky Irishman, and a lady figuring out exactly where she belongs in the world. The characters in this book are so much fun. I love Holland and her quirky nature, as well as her awesome family, or her brother and uncles, at least, who are really the only ones we get to meet, but who were awesome regardless. And then there’s Calvin, the Irish hunk who was more than a little swoon-worthy throughout the story. Though I did question a few times throughout the story, he won me over by the end, and I enjoyed watching his relationship with Holland blossom as the story went along. As I mentioned above, the storyline for this book was really fun and fluffy, which was apparently just what I needed at the moment. I don’t read contemporary romances like this nearly enough anymore, and I have no idea why because I really love them. I need to make time to read them more often, which I plan to do as soon as I possibly can! 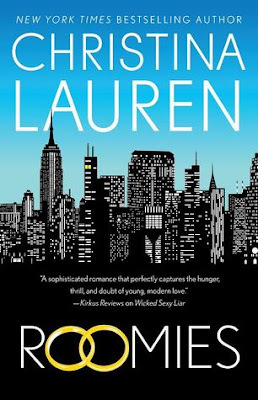 Overall; I really, really enjoyed reading Roomies, and, as I mentioned above, it’s been WAY too long since I’ve read a book by Christina Lauren. These ladies write some pretty fun stories, and I’m super behind on their books, which is something that I need to work on ASAP, and I’m thinking I need to re-read the books I have already read by them again soon as well! *grin*! Sounds something that I'd love to read close to the Christmas tree!